The Oman ophiolite is considered as an analogue to modern fast-spreading ridges. It reveals fundamental features about the mantle dynamics beneath the ridge, the geometry and dynamics of the ridge magma chamber, and the paleo ridge segmentation. 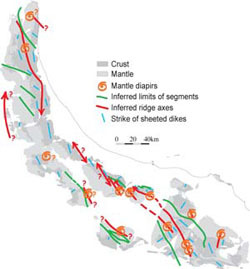 Structural maps, the result of more than 20 years of field studies conducted by the research group led by Adolphe Nicolas, were published in 2000 in a special issue of Marine Geophysical Research. Ildefonse, B., and A. Nicolas, 1994. Comment concevoir les chambres magmatiques des dorsales océaniques à partir de l’étude des ophiolites, Géochronique, 49, 20-21. Nicolas, A., F. Boudier, and B. Ildefonse, 1994. Dike patterns in diapirs beneath oceanic ridges : the Oman ophiolite, in "Magmatic systems," (M.P. Ryan, ed), pp. 77-95, Academic Press, Orlando. Ildefonse, B., S. Billiau, and A. Nicolas, 1995. A detailed study of mantle flow away from diapirs in the Oman ophiolite, in "mantle and lower crust exposed in oceanic ridges and in ophiolites" (R.L.M. Vissers et A. Nicolas, eds), Kluwer, 163-177. Ildefonse, B. and Nicolas, B., 1997. Ecoulement magmatique dans les gabbros et problème des chambres magmatiques sous les dorsales océaniques. In "Des grands écoulements naturels à la dynamique du tas de sable : introduction aux suspensions concentrées en géologie et en physique" (B. Ildefonse, C. Allain & P. Coussot, eds. ), Cemagref Editions, 37-49. Ildefonse, B., F. Boudier, and A. Nicolas, 1998. Asthenospheric and lithospheric deformation in Oman ophiolitic peridotite, in "Atlas of mylonitic and fault-related rocks," (A.W. Snoke, J.A. Tullis, and V.R. Todd eds). Princeton University Press, 588-591.